The Jackson family name is most synonymous with two things, great music and plastic surgery operations, and this article isn't about preforming arts. Janet Jackson, the youngest of the famed Jackson children, is cute as a button and perhaps the most talented of the bunch, having sold more than 100 million records worldwide. 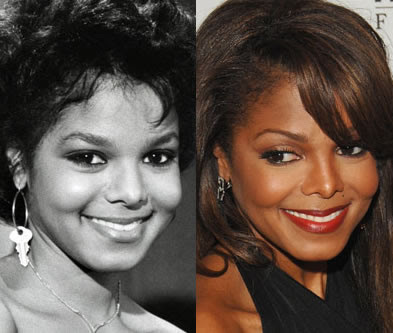 Unlike her beautiful god given singing voice, Janet Jackson has obviously had some plastic surgery to help out her appearance. There is differently no debate about the nose job (Rhinoplasty) she has underwent, shaving off quite a bit to achieve her desired look, however apart from the nose job, she looks to be all natural with a great facial bone structure, including those remarkable cheek bones. By the way, has she aged in the last 20 years? your before is actually an after. Her nose was far bigger when she was younger.